That's word from a Fair Tax rally Congresswoman Lynn Jenkins and Jerry Moran sponsored in Wichita last week. Jenkins is now apparently walking back a statement she made at the event. She told supporters, "I just want you all to know, I don't work for John Boehner. He works for me." That's not a spray tan. It's liver damage. I've long said that Jenkins being photographed next to that crying orange wasn't going to do her political career any favors. And I think she knows it now, too. It's no secret in Kansas GOP circles that Jenkins isn't a Boehner fan boy. She once told a small gathering that she would not have voted for him for speaker had an alternative been offered well in advance of the first attempted coup. There was a weak attempt to ouster Boehner from the speaker's job after the last election. It failed miserably. It was last minute, and even now, I'm having trouble coming up with the name put forward. The last-minute replacement candidate, old What's His Name, was not a good choice. Jenkins told people at the KS GOP Convention, shortly after Boehner was re-elected to the speakership, that she'd already promised her vote to Boehner by that time and had spent some time campaigning on his behalf for the role. Though it was a difficult vote that rankled her supporters, Jenkins said the alternative wasn't a realistic candidate and she'd already given her word. Someone asked why she hadn't decided to run for the job herself -- she said she'd already been running for Vice Chair. I can almost, kind of, sort of live with it -- not that I have a whole lot of choice. I don't live in Jenkins' district. 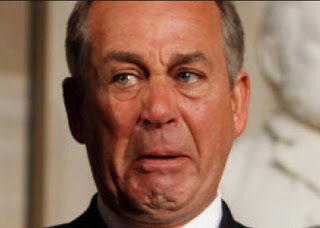 Meanwhile, there are again attempts to remove John Boehner as Speaker of the House. Thank heavens. He's so embarrassing, and he's a drunk, and he (obviously) spends too much time in the tanning bed, and he's a cries all.of.the.time. Basically, he's everything a man shouldn't be. Barf. I don't know that Jenkins' comment was accurate -- the idea that Boehner works for her -- but I am disappointed that she's walking it back. He's a tool, and his days are numbered. And the not-so-well-kept secret rumor about Boehner's drinking is reaching a fever pitch. As I wrote back in 2012, Jenkins should duck out of those photo ops with Boehner. I don't see how standing next to that guy as he drives the country off the fiscal precipice gets Jenkins anywhere but on fire at the bottom of a cliff. Read more here: http://www.kansas.com/news/politics-government/article33303969.html#storylink=cpyAs I said back in 2012, Jenkins should duck out of those photos with Boehner. I don't see how sitting next to that bawl baby orange guy as he drives off the fiscal cliff gets Jenkins anywhere but on fire at the bottom of a precipice.